On the first day after his inauguration, American President Barack Obama made it clear that in his administration, the focus of diplomatic and military efforts would shift from Iraq to Pakistan and Afghanistan. Although he has already named former Assistant Secretary of State Richard Holbrooke as his special representative to the region, the new president would do well to take note of wisdom offered by another American: former mountain climber turned impromptu goodwill ambassador Greg Mortenson. His unlikely story is proof positive that one person can have a huge impact, and unwavering intent can move mountains, even on the barest of budgets. By itself, a penny can’t accomplish much. At best, it can perhaps buy a small piece of gum or contribute towards the cost of a postage stamp. But groups of pennies in sufficient numbers have the power to build schools, change lives and even alter the way that nations view each other. The Pennies for Peace program, started by Mortenson, is a case in point. 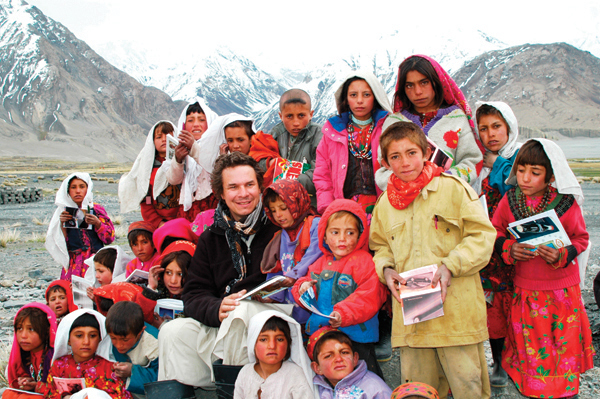 Greg Mortenson with Lalander schoolchildren. Afghanistan. Co-author of the international sensation Three Cups of Tea: One Man’s Journey to Promote Peace . . . One School at a Time, Mortenson has achieved the near-miraculous in an area known for its distrust of westerners. While the U.S. military has continued to drop bombs and fight a thankless war along the intractable border between Afghanistan and Pakistan, he has generated a lasting store of goodwill and strong relationships with local villagers on both sides. Since 1993, Mortenson and his foundation, the Central Asia Institute, have built seventyeight schools and are responsible for running four dozen others, serving more than 28,000 children. Part of his funding comes from another organization he founded, the Pennies for Peace program which is currently in place in 3,200 schools. The program allows students to practice philanthropy while learning about the culture and customs of remote villages half a world away. By now his story is well known, at least to the millions of readers who have kept it on the New York Times Bestseller List for more than 102 weeks. After an unsuccessful attempt to climb K2 in 1993, Mortenson found himself in a remote Pakistani village where he was nursed back to health. One day he observed the local children on a windswept plain, scratching in the dirt with sticks. No school, no books, no pencils – this was their classroom. He vowed to build them a school and despite the multitude of promises made by climbers over the years, who then disappeared and never returned, the village headman decided that this one meant what he said. Upon returning to the U.S., Mortenson sold all of his climbing equipment, began living in his car, and sent out five hundred letters to notables in the news entertainment industry, appealing for some portion of the $12,000 it would take to fulfill his promise. The only response he ever got was from news anchor Tom Brokaw, who sent him a check for $100. The first substantial amount he received came from the children at the Wisconsin elementary school where his mother was principal. By collecting all of their pennies, the students were able to donate $623. The lesson was not lost on Mortenson; the Pennies for Peace program was born. After two years he at last attracted the backing necessary to finance his return to Pakistan, the first in a series of many. 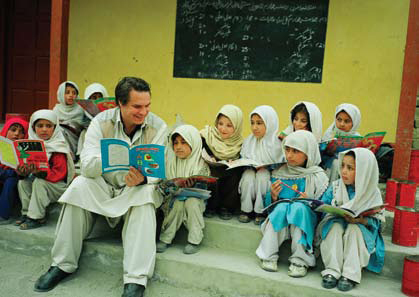 Greg Mortenson with Gultori schoolchildren. Pakistan. 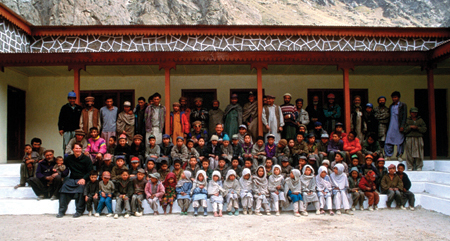 Although Mortensen provides the funding and building supplies, all of the schools are built by the villagers themselves, usually in remote areas. 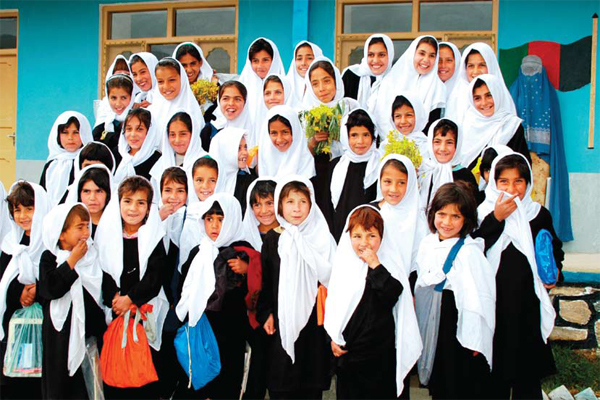 Both factors may explain why of the 170 schools for girls destroyed by the Taliban in Afghanistan, not of one them was connected to the Central Asia Institute. They serve to counteract the malignant influence of madrassas, fundamentalist Islamic schools funded by wealthy Saudis that are often breeding grounds for antiwestern sentiment. Mortensen’s involvement with communities doesn’t end with schools, which often serve double duty as community centers. 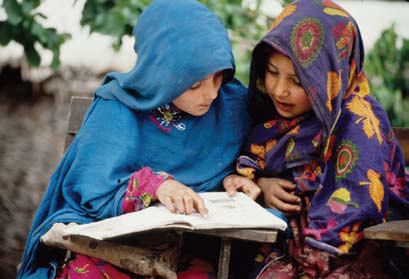 It extends to teacher training for qualified local people, addressing public health and environmental issues, and empowering women through education and other resources. Training women and creating schools for girls have proved to be financially viable; their participation in local economies acts as a stimulus and enhances the overall standard of living. On January 7, 2009, a bipartisan and bicameral group of U.S. Congress members nominated Mortenson for the Nobel Peace Prize. Pakistan’s government recently announced that he will receive their highest civil award, Sitara-e-Pakistan (“Star of Pakistan”), for his humanitarian efforts to provide education in rural areas for the past fifteen years. Meanwhile, the overwhelming popularity of his book speaks to the multitudes who are looking to find a way to understand and embrace a very foreign culture. The humble origins of his project are a reminder that bold intention rather than huge wealth is the key ingredient to changing the world.